The inspiration for the unique shape and design of the LTD F-154DX bass guitar from ESP would appear to be a mix of Route 66 Interstate signs and weaponry from an old Dungeons & Dragons manual. Forgoing the traditional, rounded apple bottom bass, the LTD F-series basses feature off centered curves, beveled edges, and points in places you won't see on any other guitar, let alone a bass. The double cutaway design makes the upper and lower horns appear to be a skeletal finger and thumb respectively. The ESP LTD F-154DX has 4 strings, with a thin "U" contoured maple neck and 35" scale. The body is made of basswood with a flamed maple top that contrasts subtly with the rosewood fingerboard. As your fingers explore the 24 XJ frets your rhythms and melodies are trapped by dual ESP SB-4 pickups and can be reshaped with the ESP ABQ-3 3 band EQ. 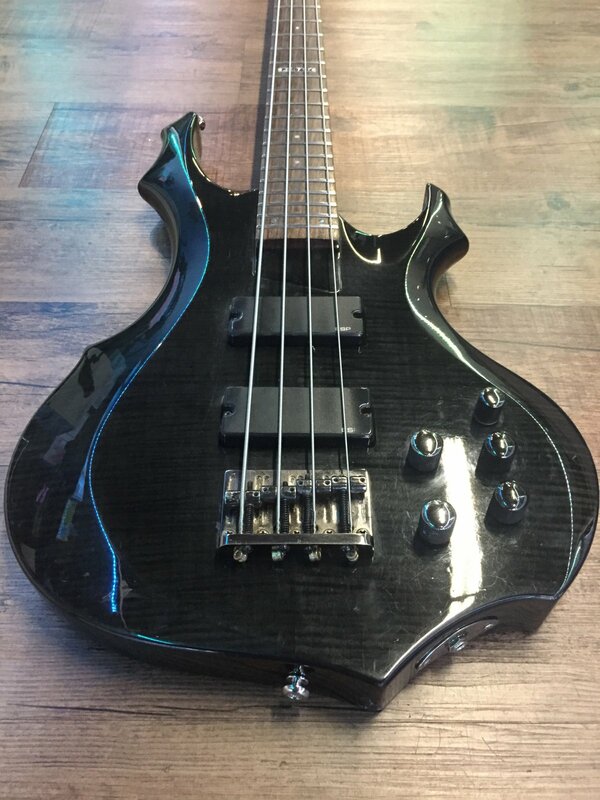 The ESP DB-4 string-thru-body bridge, tuners, and control knobs are all black nickel.